Red Hot Pokers are flowering perennials that bloom in the summer with torch-shaped, bright, red, yellow and orange flowers. Sometimes called Torch Lilies, Red Hot Poker plants can grow up to 5 feet tall and 3 feet wide, and often used as border or specimen plants. Many varieties of Red Hot Pokers exist, with slightly different but always vibrant flower colors and different blooming times. Some varieties bloom in the late spring and early summer, some in mid-summer, and others in late summer and early autumn. Red Hot Poker plants grow best in USDA zones 5 through 9, where winter temperatures don’t drop below -15 degrees Fahrenheit. Plant your Red Hot Pokers in a location with full sun and well-draining soil in the spring, after the soil has warmed up and all danger of frost has passed. Water your Red Hot Poker plants deeply once or twice each week during the hot summer months. Water during the spring and early autumn only during dry spells. Remove all spent flowers as soon as they fade to promote re-blooming of your Red Hot Poker plants. Spread a 4-inch-thick layer of bark mulch around the Red Hot Poker plants in the fall to protect them through the cold winter months. Remove the mulch in the spring, after the last frost. Cut away all the dead or damaged foliage from the Red Hot Poker plants in the early spring. You can also cut the plant down to its base in late fall. Work in some peat moss or organic compost to enrich the soil and improve drainage when you plant your Red Hot Pokers. 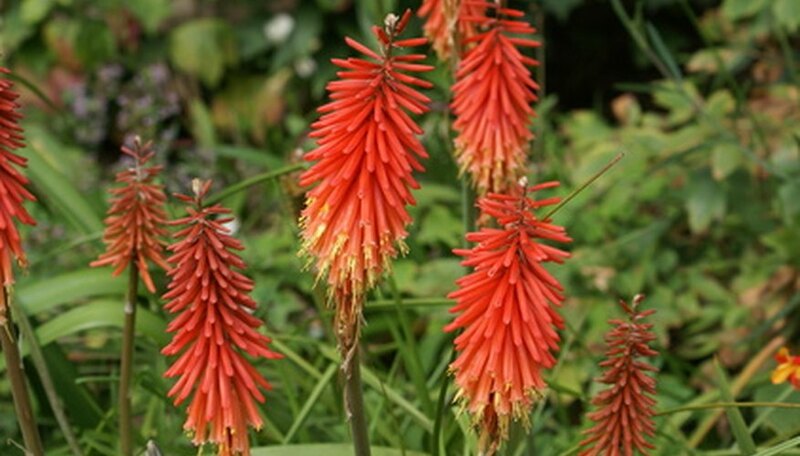 Provide at least 2 feet between the Red Hot Poker plants to give them enough room to spread.